“Now if you’ll only attend, Kitty, and not talk so much, I’ll tell you all my ideas about Looking-glass House. First, there’s the room you can see through the glass – that’s just the same as our drawing room, only the things go the other way. I can see all of it when I get upon a chair — all but the bit behind the fireplace. Oh, I do so wish I could see THAT bit!” Lewis Carroll, Through the Looking Glass, Chapter 1: Looking Glass House. 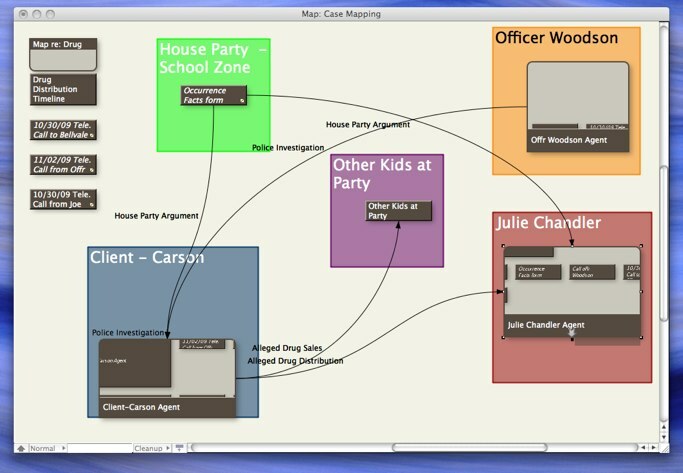 In Through the Looking Glass – Part Two we will see what Dan was thinking in setting up the Romero case Mind Maps and exactly how he used the features of Tinderbox and Summary Judgment to create them. Joe Romero called in yesterday to say that Carson and Joe have both been served in a civil lawsuit filed by Birgitta Cline on behalf of her minor daugher, Julie Chandler. The plaintiff is represented by the local “King of Torts”, I. Ken Fleecem, Esq. of the firm of Dollars and Cents, LLP. The complaint alleges serious personal injuries sustained by Julie in both auto accidents, on the theory that there is a causal connection between Carson’s involvement in the first accident and the second, which makes Carson (as operator) and Joe (vicariously, as owner) liable for the injuries she allegedly sustained in both. Approximately two weeks ago Joe sent a letter to his auto insurer, the Soulless Insurance Company, notifying Soulless of the lawsuit and asking it to defend the lawsuits against Carson and Joe. Yesterday Joe was advised that, based on its preliminary accident investigation Soulless has determined that Carson’s conduct in causing the first accident was intentional and probably criminal; and, on that basis, Soulless was denying coverage “until further notice”, not only to pay any money judgments that might result against the Romeros, but also to “defend” (e.g., to provide an attorney to represent the Romeros in the lawsuits). Dan was compelled to advise Joe, that Dan would have to defend the civil lawsuit on an hourly basis, which means that the Romeros would be paying substantial amounts out of pocket for the legal defense which they had expected to be provided by their insurance company. Moreover, at the end of the day, if Julie prevailed in her lawsuit, there might be money judgments against Carson and Joe for which there is no insurance coverage, and which might be collectible against the Romero family assets. As indicated in the suit papers, an Answer on behalf of the Romeros is due within 20 days from the time of service. But because much of that time was eaten up before Soulless’s denial of coverage, there are only 3 days left now for Dan to file a timely Answer. So the first thing Dan does is enter a Task To Do in Summary Judgment with a DueDate of 3 days from today, and a priority of “Urgent”, to make sure that it doesn’t fall through the cracks in the bustle of Dan’s busy law practice. 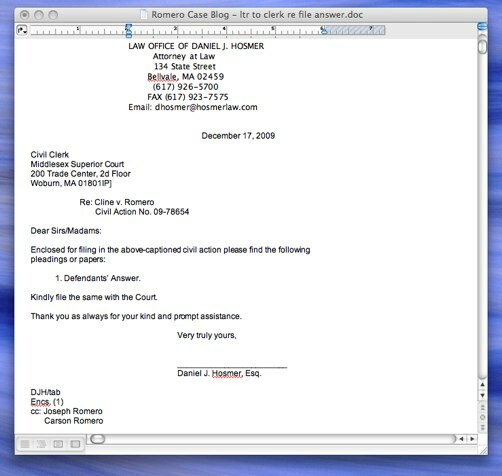 Next Dan enters “boilerplate” text in the Case File Development section of the SJ Outline with the lawsuit Case Caption; Signature Block (signature line with Dan’s name, firm, telephone, fax, email, Bar Registration No., etc. ); and Certificate of Service (with opposing counsel’s name and address, etc.). 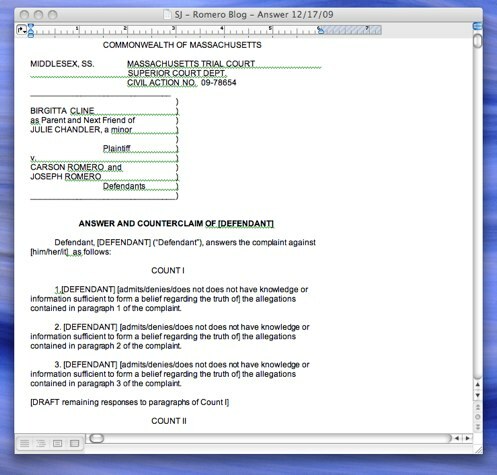 Then he quickly drafts an Answer to the complaint, and a transmittal cover letter to the civil clerk for filing the Answer and serving it on opposing counsel, using the editable forms and templates for standard pleadings, correspondence and other Case File documents furnished in the Summary Judgment outline. 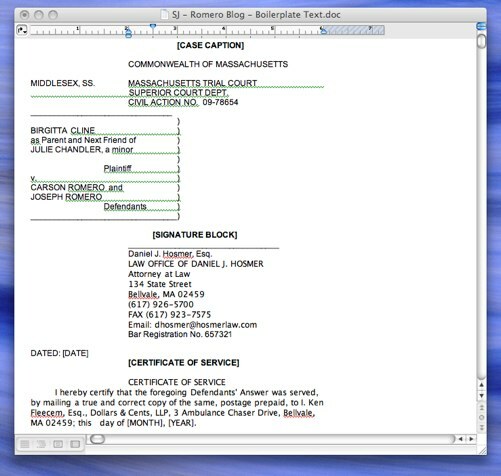 The distinction between a SJ “template” and a SJ “form”, is that a template (e.g., Pleading Template) is designed to automatically import and assemble portions of the document from pre-entered boilerplate text (e.g., for a pleading, the boilerplate sections for the Case Caption, Signature Block and Certificate of Service). “Forms” contemplate that the user will “copy and paste” the boilerplate text sections into the form. In either case the user will draft and/or edit the body of the Case File document to produce a finished edition (e.g., for filing with the court and service on opposing counsel). 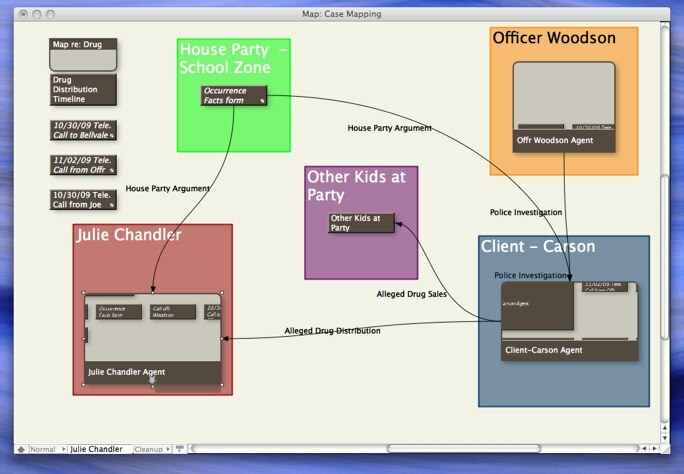 In the next post we will see how Dan uses the mind-mapping features of Summary Judgment’s underlying Tinderbox platform to travel “Through the Looking Glass,” in analyzing and understanding the complex facts and issues posed by the Romero case. Dan is a smart lawyer. So he knows that cases turn on facts. And you reap what you sow in gathering and organizing them, in being able to retrieve and employ them quickly when needed (e.g, for pleadings, hearings, trial preparation, etc.). 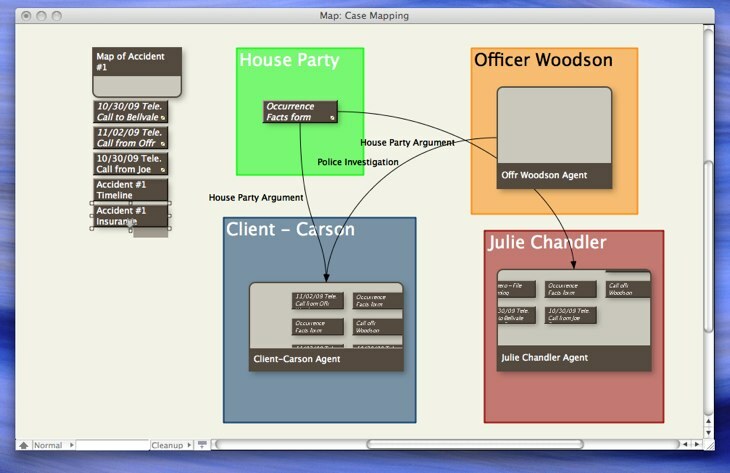 Although the Romero case is in its infancy, Dan has already gathered a treasure trove of investigation and research materials which he has stored and organized in SJ’s outline (e.g., accident reports and police reports for both accidents; Julie Chandler’s medical records; the Police Lab report with respect to the pills found in Julie’s car). Dan has scanned these documents as PDF files and “dropped” the PDF files into their designated subfolders in the Case File Development – Investigation subsection of the SJ outline. 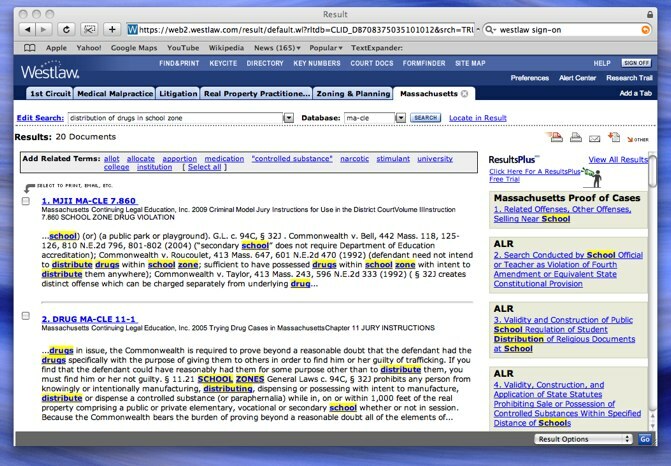 He has downloaded the relevant statutes and pertinent case law and commentary relating to each offense from his online research system, and he drops those research materials into the Case File Development – Legal Research subsection of the outline in custom subfolders created for Assault and Battery Dangerous Weapon; and Poss./Distribution of Class A Drugs – School Zone. Now it’s time to make heads or tails from it all. Here’s where Summary Judgment earns its keep. The first thing Dan does is break down the legal issues into their natural compartments. 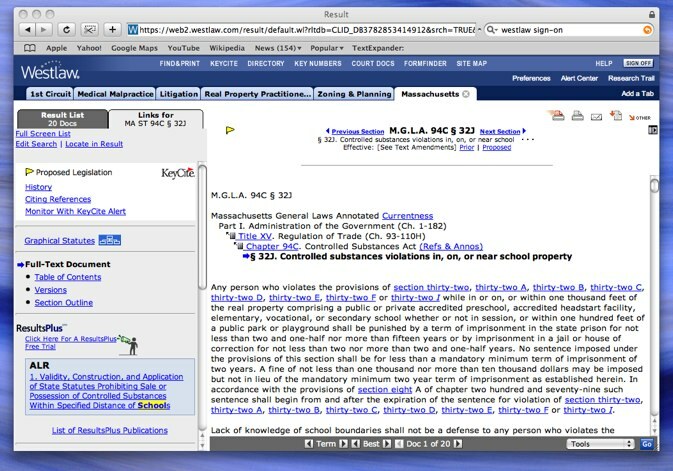 For example, in the Legal Issues subsection under “Substantive Issues”-“Liability/Breach”- he creates two customized subfolders, one for “A&B dangerous weapon” and the other for “Poss./Distribution Class A Drugs – School Zone.” Each subfolder operates as a separate “Note” in Tinderbox, which means that it can store large amounts of materials pertinent to it, including attaching PDF files in the “drop file” area of the Note. Dan “drops” the pertinent statute of each offense into the “drop file” section of each subfolder. 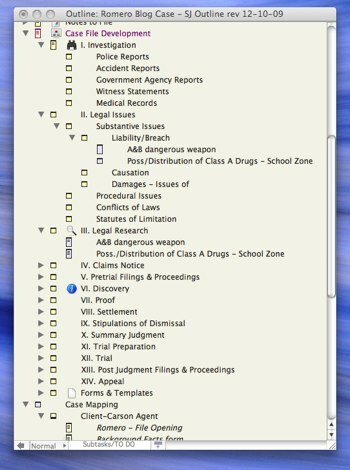 In the text section of the relevant subfolders he begins to summarize the case file information relevant to each offense. As the case unfolds and more investigation and discovery information is furnished, he will update these sections of the SJ outline so they represent the current state of his knowledge. You are currently browsing the Winvictus's Summary Judgment™ blog archives for December, 2009.